DIY pop icons The Cannanes launch their first album in more than a decade! 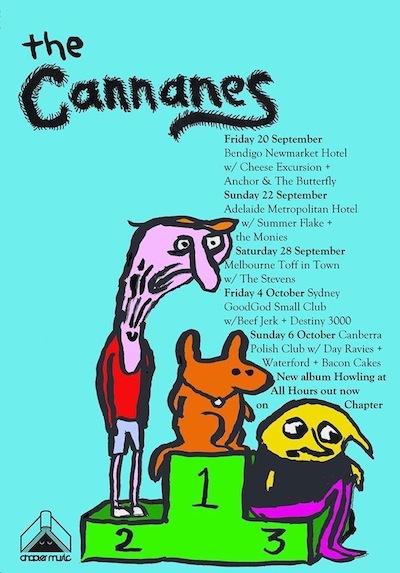 First forming in Sydney in the mid 1980s, the Cannanes have released ten albums on labels all around the world, toured the US, UK, Mexico, Japan, and Europe, and been immortalised in books and documentaries by devoted fans. Howling At All Hours features the core trio of vocalist Fran Gibson, guitarist Stephen O’Neil, and prodigal drummer David Nichols are the core trio, but also has cameos from sometime Cannanes members James Dutton (Flywheel. Deep Country ), Mia Schoen (New Estate, Sleepy Township), and Fran Bussey (Nice, Dusken Lights).